Today Mom and I wanted to have a day of just Alyce and us. We thought that just the three of us time would be good for everyone. I am happy to say that it was a success. While our original plans didn't completely pan out what we did end up doing was enjoyed by all. Earlier this week we had heard a story of new attraction opening up. The attraction was miniature steam train that would pull mini train cars of people sitting single file. We thought something like a miniature train would be cool for the family to enjoy together. Before the train ride we took Alyce to McDonald's for lunch. Alyce behaved herself for the most part and she got a neat toy with her happy meal. After lunch we ventured to the park and this is where our plans took a turn. It turns out that the train doesn't open for another week. While this would normally be a large problem it didn't turn out that way. We didn't build up the train ride as much as we built up time together. We made the most of the outing by making use playground equipment at the same park. The slides at the park were just her size and the skies were overcast so there wasn't any danger of being burned by hot plastic parts. At first Alyce was a bit apprehensive of the slides and just wanted to go up and down the stairs. After a few minutes of that I sat down for a slide and she wanted to ride in my lap. After the first ride she was hooked. She and I rode the slide time and time again. 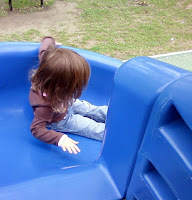 Alyce eventually built up the courage to try a slide herself. This burst of courage was interesting in that there was no pause to her actions. She simply walked past me, sat down, and went down the slide. She didn't wait for my approval or any other question I had for her. She just did it. Her slide riding skills have also improved. She stayed upright and was in complete control the whole time. We did take a break from the slides to go take a look at the trains. The group that was setting up the trains and the tracks were there putting the finishing touches on everything. We told Alyce that we would come back and ride the trains next weekend. Alyce had some first time experiences while at the park. On the way to the train we taught her how to pick dandelion seeds and blow them to the wind. She doesn't have the lung power to do it by herself, but she thought all the seeds scattering to the wind was great. 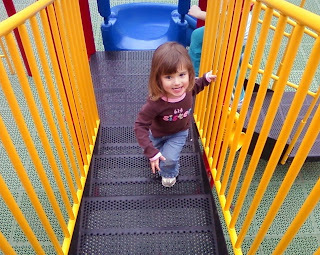 Alyce also climbed up a slide for the first time. 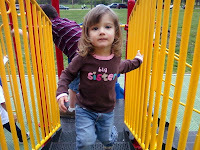 While heading back towards the stairs Alyce watched an older girl climb up the baby slide. 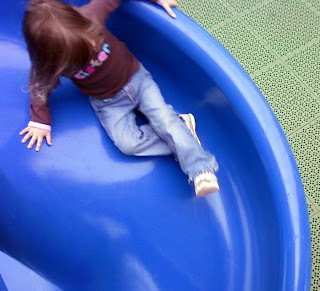 Alyce must have thought doing that was pretty cool as she followed the older girl right up the slide. While this isn't something we would encourage it was very nice to see that Alyce is branching and taking some chances. It started raining and we used that as a signal it was time to go. Alyce didn't mind much as wet slides don't go very fast. We very much enjoyed our day with Alyce and I think she liked it too. It was a good reminder of how fun kids could be. I hope Alyce can build upon this experience to realize that her world isn't collapsing just building into something a bit different and hopefully better. 0 comments on "Day At The Park"